RT reports that allegedly only four helicopter loads of water have so far been dropped, and that 100 loads of water are needed to even have any cooling effect. Not good. When the last resort is dropping water onto nuclear rectors from helicopters is the solution being used you know it’s really bad. It looks like most of the water spray misses the target (hard to tell from the camera angle). Clearly nuclear reactor designs must be revisited to take into account a complete loss of the coolant systems. Safer designs are a must, and designs that don’t have the flaws seen at Fukushima are a must. Some immediately obvious design improvements. (4) and the icing on the cake of 2012 doomsday writ 20 months early, Volcanic Eruption in Japan at Shinmoedake Volcano! Just how does one defend against each of these “doomsday scenarios”, let alone when they all happen at once? (2) Tsunami Wave Surge Doomsday. (2c) Post Tsunami Devastation. Would you really build here again? Really? (4) Shinmoedake Volcano spewing hot magma destruction Doomsday. The 2011 Sendai earthquake and tsunami was massive, possibly the largest ever recorded in Japan. There are many people injured or killed or missing. There were massive tsunami surge waves that have devastated the coastlines of parts of Japan. In addition to the Earthquake, Tsunami Surge Waves, and human toll there is a serious risk of a nuclear incident unfolding. Another hydrogen explosion has rocked the Fukushima Daiichi nuclear power plant, this time at the third reactor unit. Initial analysis is that the containment structure remains intact. The blast that occurred at 11.01am today was much larger than the one seen at unit 1 two days ago. An orange flash came before a large column of brown and grey smoke. A large section of the relatively lightweight roof was seen to fly upwards before landing back on other power plant buildings. OK, stop the presses, there is an article about study done by NCAR on the simulation of winds and how that might move water in dramatic ways. That is all fine and good except for the connection to the following religious notions and the fact that US Government Funds were used in this obviously religious study in violation of the strict Separation of Church and State in the USA. 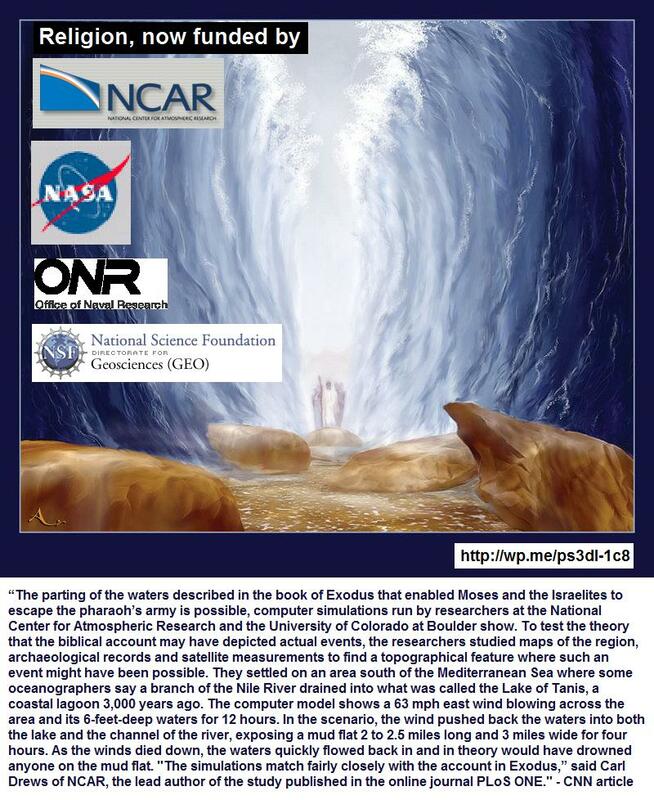 “The parting of the waters described in the book of Exodus that enabled Moses and the Israelites to escape the pharaoh’s army is possible, computer simulations run by researchers at the National Center for Atmospheric Research and the University of Colorado at Boulder show. To test the theory that the biblical account may have depicted actual events, the researchers studied maps of the region, archaeological records and satellite measurements to find a topographical feature where such an event might have been possible. They settled on an area south of the Mediterranean Sea where some oceanographers say a branch of the Nile River drained into what was called the Lake of Tanis, a coastal lagoon 3,000 years ago. Pat Robertson says the Haitians are “cursed” due to a deal with the devil made to get out from “under the heal of the French” and that this earthquake is payment on that deal with the devil. WTF? “Something happened a long time ago in Haiti, and people might not want to talk about it. They were under the heel of the French. You know, Napoleon the third, or whatever. And they got together and swore a pact to the devil. They said, we will serve you if you will get us free from the French. True story. And so, the devil said, okay it’s a deal. Pat Robertson is an evil immoral man spinning his bronze age belief stricken mythology at people in their time of need due to a Natural disaster. If there is any curse it is in the existence of Pat Robertson’s horrific mindset. The scammer Pat Robertson is proof that God can’t exist and that opportunistic vile evil men can, will and do take advantage of people’s inability to set aside primitive superstitious beliefs. The following video shows the results of a deep programming and cult inculcation of a “radical ecological green” belief system. This deep devotional commitment is in part fostered during a long period of fasting and indoctrination with fellow cult members. It is very disturbing as it reveals a deeply commuted individual that would be willing to take just about any action in “the revolution”. A very dangerous video for anyone who falls for it. At the end under the increasing music he utters “Long Live the Revolution!”. The deep and disturbing power of belief in ecological sustainability at any cost forms the foundation of The Potently Dangerous Militant Cult of Ecological Sustainability. The acceptance of the Nobel Peace Prize by Barack Obama, the US president, has sparked constroversy. Obama received the prize dedicated to peace in Oslo, pledging to strive for a better world and pursue building a “just and lasting peace”. But critics have attacked the decision to award the prize to Obama, pointing out he is actively leading his nation in the wars in Afghanistan and Iraq and last week ordered 30,000 more troops to join the Afghan conflict. The Nobel Prize was created by an arms merchant of death, Alfred Bernhard Nobel. Unlike theories such as Anthropogenic Global Warming aka Climate Change, there is ZERO doubt about this very real serious threat. At 93 million miles away it would seem that we are safe from the suns wrath. But are we? The sun is the superpower of our solar system, a thermonuclear blast furnace, erupting with massive explosions. At 93 million miles away it would seem that we are safe from the suns wrath. But are we? With some experts predicting the most violent outbreak of solar activity in modern history its never been more important to understand the secrets of the sun. 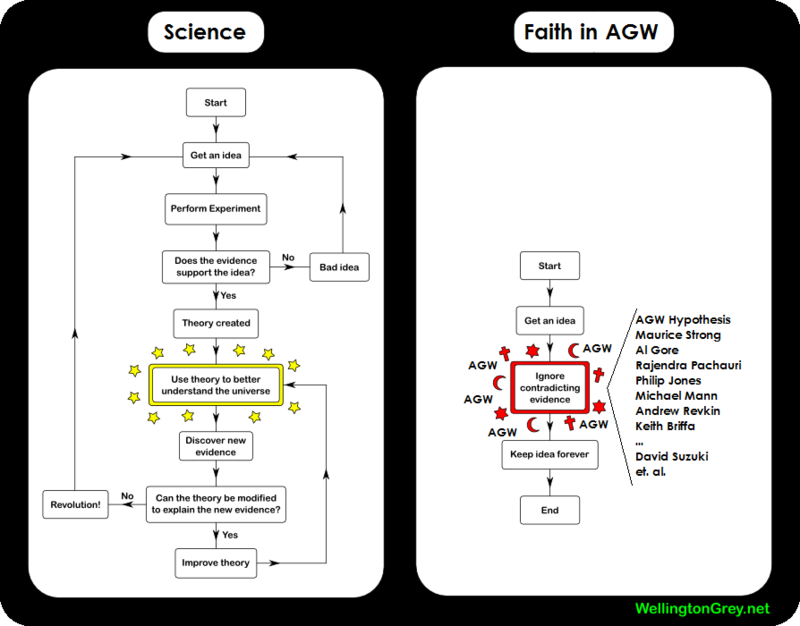 While we debate whether or not humans are the cause of Global Warming we are at the same time running the experiment. We are in the test tube. His logic is too binary, too simplistic. His argument depends upon the argument being framed in simplistic terms. When reality is brought into the picture the argument falls apart. The world is much more fuzzy than presented in the video. Also, each solution has other reasons than AWG to do it thus the logic is totally faulty. Too many false choices presented in this video. Yes, his world is a world straight out of science fiction. Utter nonsense. Our future is not rows and columns, it’s much more complex thus it requires a much richer and more subtle representation system than four possible boxes. Thus “the only choice is [NOT] column A”! The problem is that your way of representing the issues, problems, solutions, possibilities and realities is too limited leading to false conclusions that are needless. Yes, you are wrong Greg due to simplistic logic disconnected from objective reality. Just like those with invisible friends. What I like about his presentation is that at least he is willing to discuss the issues even if his methods are too simplistic. My thoughts are that his arguments are too simplistic and thus don’t reflect reality however that’s how most people want their “political” choices presented to them: A, B, C, or D. Pro/Con. True/False. Row/Column. No deep thoughts. The problem is that over the long term this might not be a viable way of thinking and choosing or making political decisions since it too easily diverges from objective reality too far. A deeper level of scientific argument with a richer representation and decision making methodology is required for the presentation of political choices that need to be rooted in hard science that reflects the actual objective reality. What do you think about the logic presented in this video?